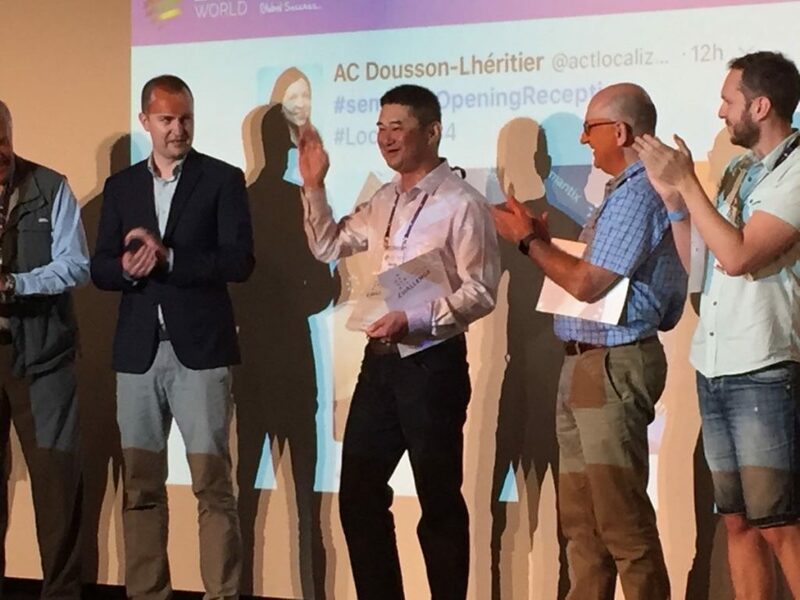 June 20, 2017, Toronto – Boffin, an Asian language provider, is pleased to announce that it has been named the LocWorld Process Innovator 2017 by winning the prestigious Process Innovation Challenge (PIC) at LocWorld in Barcelona, Spain. George Zhao, President and co-founder of Boffin, demonstrated a simpler, less time-consuming process of localizing video using its new VideoLocalize platform. Calling this new innovative process “Interpreting Video”, Zhao combined the translation, voiceover and post-engineering aspects of the video localization process into one simple step. Held on June 15-16, 2017, the Process Innovation Challenge (PIC) is a fast and furious competition, taking the top 6 out of the 35 innovation entries and shortlisting them down to two finalists. The top two then goes through to the final round on day two. The winner, chosen by three Process Dragons and the audience, is then named the LocWorld Process Innovator 2017. Boffin beat out the other finalist, a Microsoft innovation, with its cost-saving and time-saving approach to video localization, to take this coveted title. With VideoLocalize’s innovative technology, one can significantly simplify the video localization process by merging the translation and voice-over recording aspects into one process: direct interpretation into the tool. The synchronization feature automatically adjusts the video and voice over recording lengths so that they match. Usually, this part of the process would have to be done manually, requiring hours of tedious work. We are working hard to revolutionize the way you do video localization. Leave us your email below to receive the latest updates.